It takes full advantage of the season's best ingredients. I make my own pesto (here's my favorite pesto recipe), but once or twice I've fallen back on store-bought pesto, and the pasta salad is still almost as good. If you like your pasta salad more complicated, by all means add more stuff - little balls of mozzarella, capers, a few chopped bell peppers, olives, all those would go very well with the pesto and cherry tomatoes. I prefer the plainer version. Why? See number 1 above. Bring a large pot of water to a boil. Salt the water and cook the pasta according to the directions on the package. Drain the pasta, put it in a big mixing bowl, toss it with the olive oil, and let it cool about half an hour. You don't want the pasta to be hot when you add the sauce - the pesto will lose its vibrant green color and edge toward brownish. That will happen soon enough on the buffet table, but you might as well start the dish out with every advantage. When the pasta is mostly cool, add the pesto and mix well. Scatter the cherry tomatoes and basil leaves on top of the bowl. Serve at room temperature. During summer I'm all about easy recipes that showcase the wonderful produce of the season. This pasta recipe fits the bill. 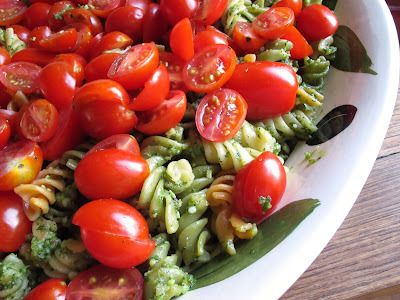 Pesto sauce and cherry tomatoes sound so good, I don't think I would want to add anything else. You had me at "pasta," but that photo really drew me in. Who can resist such a bounty of fresh tomatoes and some pasta? @Monet - I'm with you. A purist. Pesto and tomatoes, no need for more. @Patti - I do love me the cherry tomatoes! Oh dear - yes, you do want to see that, don't you! Hey, what are you doing here? I hear you've been really busy the past few days...ELOPING! Congrats, can't wait to hear the whole story!